It is our great pleasure to announce that our R&D Department has developed a new reagent for Carbon dioxide (CO2) detection, specifically designed to satisfy all winemakers needs. Carbon dioxide is generally present in wine due to fermentation and the use of CO2 for transfer operations during winemaking. CO2 plays a key role in the taste balance of still wines and helps modulate their sensory profile. Overall, the CO2 stresses perceptions of freshness and acidity, it attenuates sweet perception, it intensifies bitterness and astringency and it can lead to itching sensation. In the bottling of still wines, CO2 levels are generally between 300 and 1500 mg / L. Until this stage, it is advisable to preserve CO2 in wines as much as possible. Regardless of the technique chosen, it is important to measure the concentrations of CO2 dissolved in wine and so recommended by the OIV. 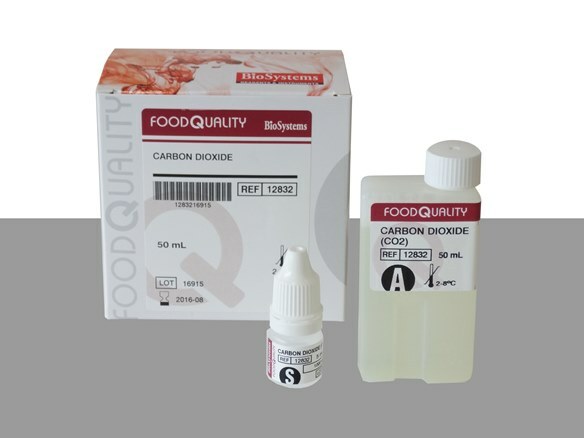 Our BioSystems Carbon dioxide kit is liquid calibrator and stable till expiration date. A liquid standard is also supplied inside the kit. These characteristics result into a unique kit in the market. Ref. 12832. Carbon dioxide. 50 mL. With the launch of this new test, our wine analysis system already provides 28 reagents, wine controls and a multiparametic standard. We are convinced that the new kit will provide the best way for improving your daily routine in the lab, getting a better product positioning in wine market.